The third day of English angler David’s fishing holiday saw the angler once again fishing at Bungsamran Lake for Giant Siamese Carp and Mekong Catfish. Fishing to a regularily baited marginal area with bottom bait tactics soon resulted in a small Striped Catfish which had taken a liking to the heavily scented groundbait. After a quiet spell which saw large swirls appearing above the baited area a high speed take saw line evaporating from the open spool of the reel. Clamping down onto the spool of the reel saw the powerful run stopped and the unseen fish turning sharply towards the underwater snags. Applying as much pressure as humanly possible saw the unseen fish once again turned away from the danger area and moving quickly out into open water. Whilst out in open water the fish embarked on another high speed run towards nearby structure requiring the angler to apply maximum side strain to once again turn the fish away from the snags. Large vortices broke the surface of the water as a large Giant Siamese Carp boiled just below the surface several yards from the fishing platform. David carefully guided the Giant Siamese Carp towards the net where it was netted on the first attempt by Boy. The Giant Siamese Carp was hoisted onto the unhooking mat where it was proudly displayed by the captor. 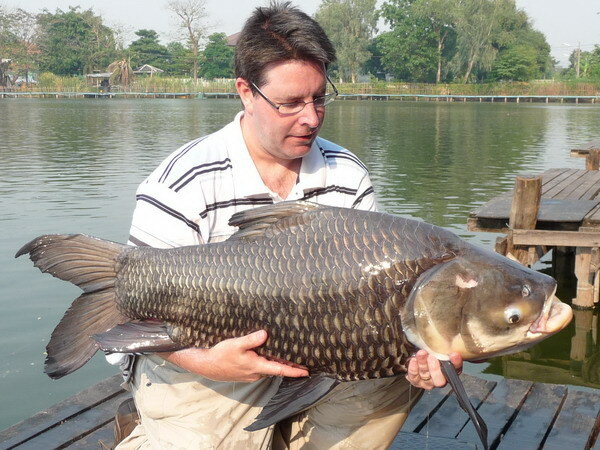 The Giant Siamese Carp was estimated to weigh 20kg’s and was released after a few quick trophy shots. David and his wife continued to fish into the afternoon and added a succession of Mekong Catfish and Striped Catfish to their days tally with Mekong Catfish to an estimated 26kg’s and Striped Catfish to 8kg’s.